← Old Spice: Making Macho Mucho. 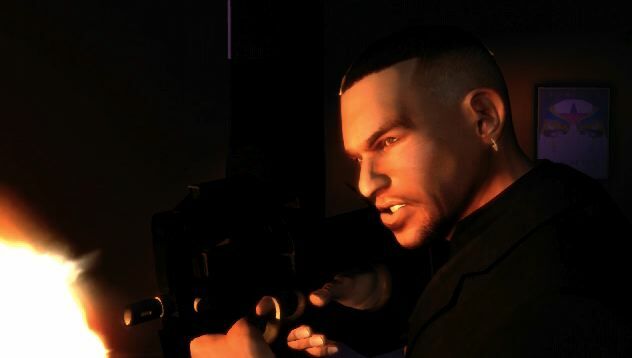 The first of Gay Tony‘s, certainly, several trailers, each deepening the sordid narrative of the game’s fictional Liberty City, dropped yesterday. Titled, “You’ll Always Be the King of This Town,” it’s a whirlwind of beautifully chaotic scandal. What’s always fascinated me about Rockstar’s trailers is how they truly convey both the games’ intense violence and wry, punchy humor. They do this, however, while modeling R*’s aspirations to have their games compared, not to other games, but to movies. If you’re old enough (over 18), you can log directly onto Rockstar’s Gay Tony web site and watch, or download, the piece in either Windows, QuickTime, standard, or HD formats. If not, study the YouTube version, below. Clip highlights (and there are many): A slow-motion tracking shot of Lopez in a crowded club, aggressively moving in on prey; the horse-like kick of his AA-12 automatic shotgun; the sight of the gunman, emerging from a devastating explosion, riding a golf cart; the scene where a Sikorsky S-64 Skycrane hoists a New York…er, Liberty City subway car right off its track, Lopez clinging for life; a building crane collapse, below; and Rockstar music supervisor Ivan Pavlovich’s rich, hi-NRG soundtrack, lushly layering the entire noir. Rockstar Games: You will always be the king of this town.